Verfasst von pw am Sa, 11/05/2011 - 09:42. Hindu Widow Marriage / Ishvarchandra Vidyasagar. A complete translation, with an introduction and critical notes, by Brian A. Hatcher. - New York : Columbia University Press, 2011. - ca. 272 S.
Before the passage of the Hindu Widow’s Re-marriage Act of 1856, Hindu tradition required a woman to live as a virtual outcast after her husband’s death. Widows were expected to shave their heads, discard their jewelry, live in seclusion, and undergo regular acts of penance. Ishvarchandra Vidyasagar was the first Indian intellectual to successfully argue against these strictures. A Sanskrit scholar and passionate social reformer, Vidyasagar was a leading proponent of widow marriage in colonial India, urging his contemporaries to reject a ban that caused countless women to suffer needlessly. Vidyasagar’s brilliant strategy paired a rereading of Hindu scripture with an emotional plea on behalf of the widow, resulting in an organic reimagining of Hindu law and custom. 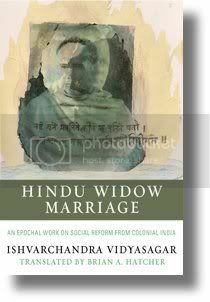 Vidyasagar made his case through the two-part publication Hindu Widow Marriage, a tour de force of logic, erudition, and humanitarian rhetoric. In this new translation, Brian A. Hatcher makes available in English for the first time the entire text of one of the most important nineteenth-century treatises on Indian social reform. BRIAN A. HATCHER is professor and Packard Chair of Theology in the Department of Religion at Tufts University. His research centers on Hinduism in modern India. He is the author of Idioms of Improvement: Vidyasagar and Cultural Encounter in Bengal; Eclecticism and Modern Hindu Discourse; and Bourgeois Hinduism, or the Faith of the Modern Vedantists: Rare Discourses from Early Colonial Bengal. Profile page.